Nazia Wadee is a born and bred Johannesburger who is doing honours in Media Studies. The 21-year-old Miss Teen Commonwealth South Africa 2015/2016 is a semi-finalist in the Miss Earth competition. What does Miss Earth mean to you? Miss Earth South Africa is a women’s leadership programme that aims to empower and educate South African women through the lens of environmental sustainability. It aims to create awareness about issues concerning conservation, sustainability and development. 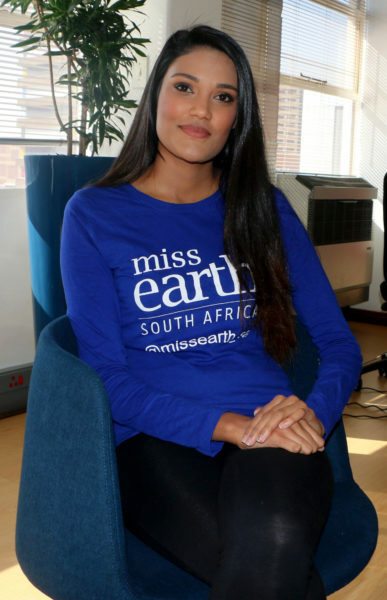 Being a semi – finalist for Miss Earth SA has been an educational and enlightening experience. This platform has allowed me to live out my true potential, break my barriers and to live out what I believe is my life purpose, which is to give back and make a difference. What inspired you to enter the competition? Given that I am a responsible active citizen who is passionate about positive change, the core values and duties of a Miss Earth title winner are that which I would like to continue to associate myself with. As former Ms Teen Commonwealth South Africa, I fell in love with the important duties that a titleholder has and the massive platform available to create a better life for all. My journey as a philanthropist had begun with the understanding of human suffering through exploitation or social prejudice at grass roots levels. What do you do to effect change? I have been afforded the honour of being the ambassador for the Youth Managers Foundation South Africa. The organisation aims to develop and discover leaders in underprivileged schools, and provides them with the necessary tools, leadership skills and resources to make positive changes in their schools and their community. I am involved in various welfare, cultural and goodwill initiatives, leading me to be a recipient of a Women of Wonder award as well as a second place award for the Nelson Mandela Youth Leadership award hosted by East Wave radio station. My love of goodwill initiatives has recently awarded me with the position of Head of Student Affairs on a university governing body. How do you balance your studies and modelling? I have always been active in terms of running charitable projects or initiatives or involved in sports or other extracurricular activities. The most important thing that I have learnt is have good time, management skills and learning to find balance. Passion is a powerful thing, and can drive you do to amazing and sometimes unexpected things, only because we are capable of so much more than we believe. What do you hope to achieve with the Miss Earth competition? My goal is to expand my knowledge, grow, empower myself in order to address critical social and environmental issues within my communities. My aim is to create awareness with regard to the various environmental issues that we face, and possibly provide solutions to them; to beautify my environment and make my community a beacon of hope for what is possible, for the betterment of all. I hope to inspire young people to get involved in our community and follow their passions. I hope to touch lives through my projects and initiatives. I hope to build lifelong friendships and bonds with the new people I have had the opportunity of meeting or the people that I will meet in the future. Furthermore, my aim is to empower those I meet along the way as well as those around me. Irrespective of the competition’s outcome, if I achieve this I believe that that will be my success. What words would you share with young girls who look up to you? Being from a small town, if I win this title it will raise the hope of others, to believe that nothing is impossible. The human spirit is amazing. In the direst circumstances the instinct to survive triumphs everything – so me winning this title will allow others to follow in my path and escalate humanity and our humanness to a level I know we can achieve. Wits Vuvuzela, Q&A with Busisiwe Mkhumbuzi. July 27, 2018. Wits Vuvuzela, Q&A: Motivational speaker Arshad Suliman. April, 2018.